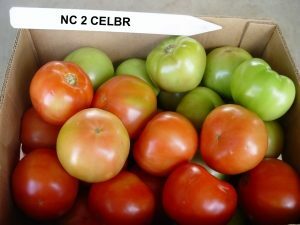 NC 1 CELBR incorporates combined early blight resistance (Campbell 1943 and PI 126445 origin) and late blight resistance (Ph-2 and Ph-3). Also resistant to Verticillium wilt (Ve gene) and races 1 and 2 of Fusarium wilt (I and I-2 gene). Vigorous determinate plant with heavy foliage. Deep oblate to flattened globe fruit are firm and highly crack resistant; late maturity; larger fruited than NC 2 CELEBR. NC 2 CELBR incorporates combined early blight resistance (Campbell 1943 and PI 126445 origin) and late blight resistance (Ph-2 and Ph-3). Also resistant to Verticillium wilt (Ve gene) and races 1 and 2 of Fusarium wilt (I and I-2 gene). Vigorous determinate plant with heavy foliage. Deep oblate to flattened globe fruit are firm and highly crack resistant; late maturity. 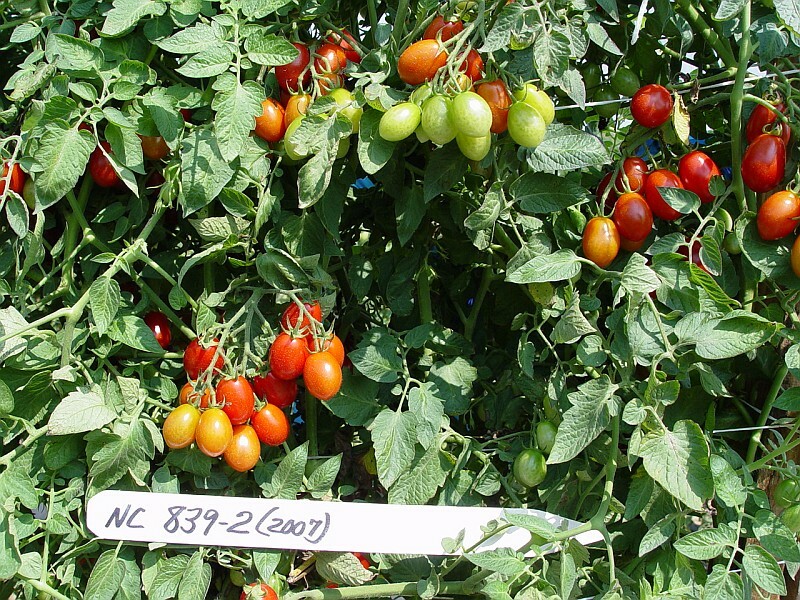 NC 58S has the Sw-5 gene for resistance to tomato spotted wilt virus. Plant type is determinate with slight leaf curl. Fruit set is fairly concentrated, and fruit are large in size. Fruit have the nippled gene (n) and have smooth blossom end scars with very little prominent nippling seen under field conditions. It is useful as a parent in developing ‘Mountain Spring’ type hybrids. NC 714 is a large-fruited, inbred, fresh-market tomato breeding line with genetic resistances to verticillium wilt (Ve gene) and fusarium wilt races 1 and 2 (I, I-2 genes) . 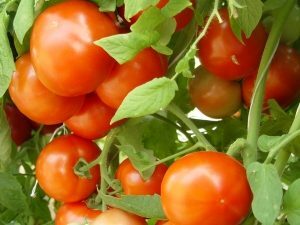 It has the crimson (ogc) gene for improved red color and increased lycopene content. 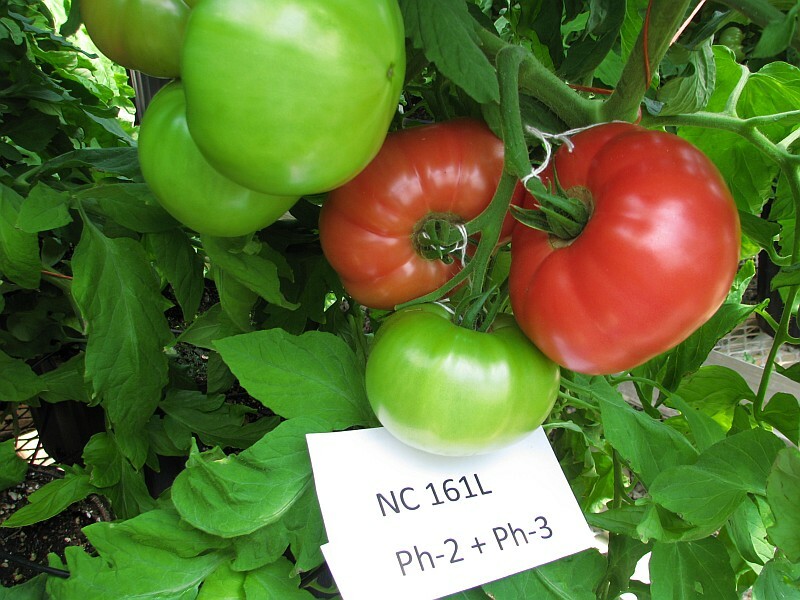 NC 714 is useful as a parent in developing superior F1 hybrids with large fruit size and increased red fruit color and lycopene content. 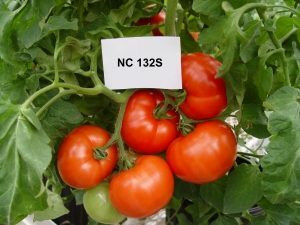 NC 123S has tested homozygous for markers for the Sw-5, Mi and I-3 genes. It has a determinate growth habit with a fairly tall open plant. Foliage is noncurled and is dark green. It is useful as a parent in developing high quality hybrids with multiple disease resistance. 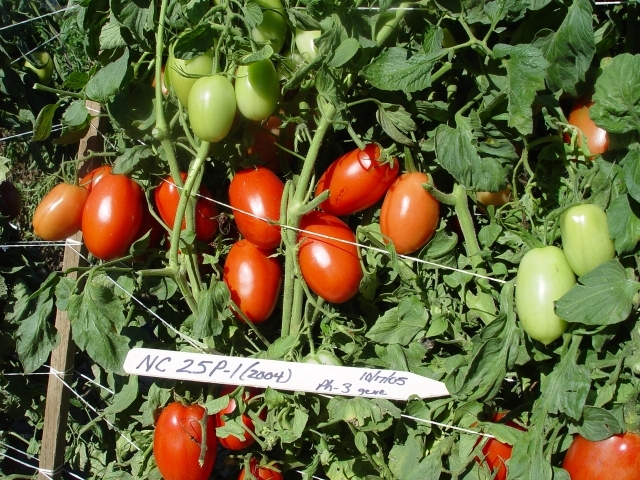 NC 127S has the Sw-5 gene for resistance to tomato spotted wilt virus. 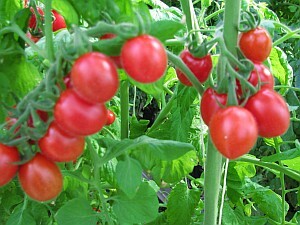 It has a medium sized determinate vine with noncurl foliage and has shown heavy fruit set with good size and firmness. 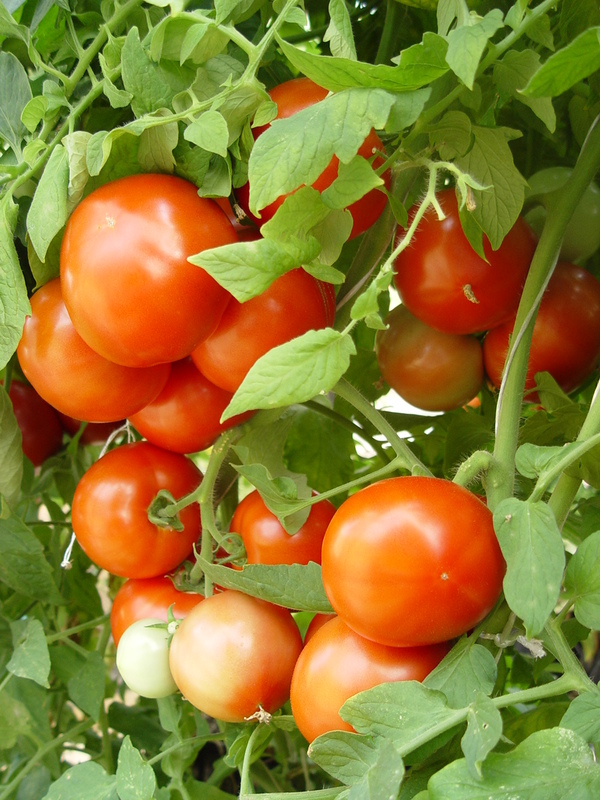 It has combined well in F1s and is useful as a parent in developing hybrids with tomato spotted wilt resistance. 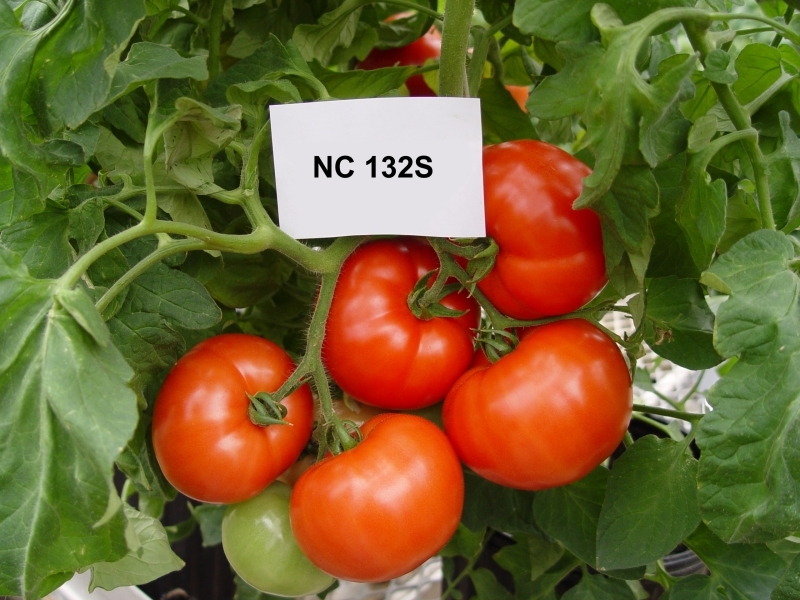 NC 132S is homozygous for the Sw-5 gene for tomato spotted wilt virus (TSWV) resistance. Has Ve gene for Verticillium wilt race resistance; I and I-2 genes for resistance to Fusarium wilt races 1 and 2; Mi gene for root knot nematode resistance. Determinate growth habit; adaxial leaf curl associated with the n (nippled) gene for pinpoint blossom end scar. Jointed pedicels and uniform light green color of immature fruit. Mature fruit are firm and resistant to fruit cracking. It is useful as a parent in developing ‘Mountain Spring’ type F1 hybrids. NC 1 CS has the Sw-5 gene for resistance to TSWV. It is also resistant to verticillium wilt (Ve) and fusarium wilt races 1 and 2 (I and I-2). Large, deep oblate fruit with jointed pedicels. Firm, deep red color (crimsongene). Excellent combining ability as a parent in F1 hybrids. NC 1 rinEC (right) compared to normal rin (left). NC 1 rinEC has a determinate plant with slight foliage curl. It has enhanced color compared to normal rin as a result of incorporation of the crimson gene along with another genetic factor which enhances color in the rin background. This line is useful in developing rin F1hybrids with improved fruit color. It is a parent in the F1 hybrid ‘Mountain Crest’. HortScience article: Gardner, R. G. 2006. 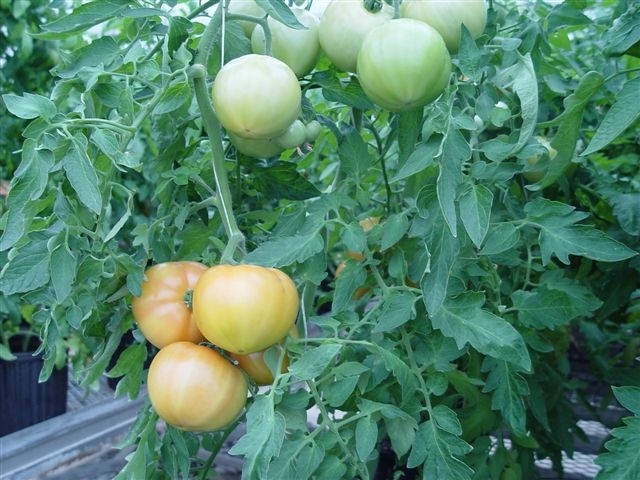 ‘Mountain Crest’ hybrid tomato and its parent line, NC 1 rinEC. 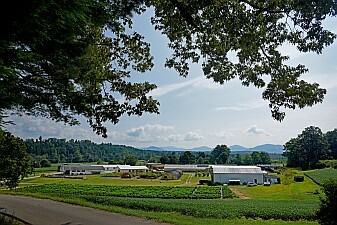 HortScience 41:261-262. 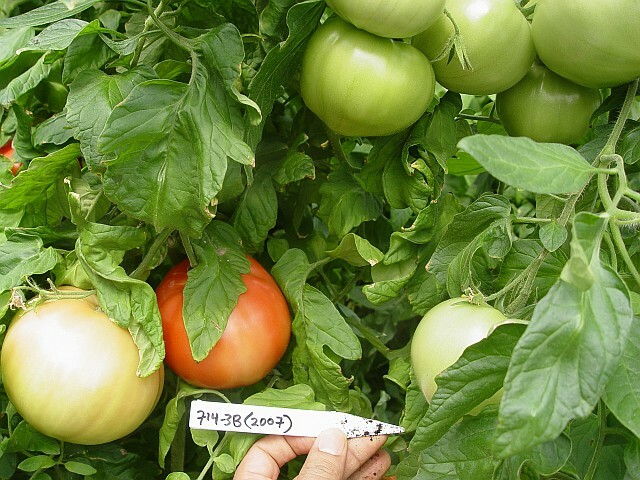 NC 2 rinEC determinate line has the crimson gene combined with the rin gene in an enhanced color background; large, smooth fruit; jointed pedicels; smooth leaf type (non curl); useful as a parent for developing rin hybrids with improved color. 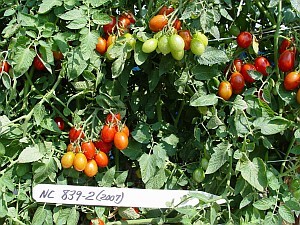 NC EBR-7 fresh market plum (Roma) tomato line. Elongate fruit shape, jointless pedicel, crimson gene, determinate growth habit, early blight tolerant, resistant to fruit cracking and weather check; line is segregating for the ms-10 male sterile gene linked to the aa green stem seedling marker gene to facilitate its use as a female in producing F1 hybrid seed. NC EBR-8 fresh market plum (Roma) line. Fruit are deep ovate with jointed pedicels; has the crimson gene; determinate growth habit with dark green foliage; early blight tolerant and resistant to race 3 of fusarium wilt (I-3 gene); resistant to fruit cracking and weather check. This is a parent in the F1 hybrid ‘Plum Crimson’ (NC EBR-7 x NC EBR-8). Needs to be crossed with a highly elongate type such as NC EBR-7 as the other parent to obtain desirable fruit length in the F1 hybrid. 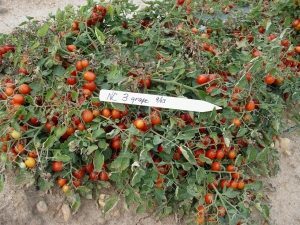 NC 25P is a fresh market plum tomato line with the Ph-3 gene for late blight resistance and crimson gene for increased lycopene. 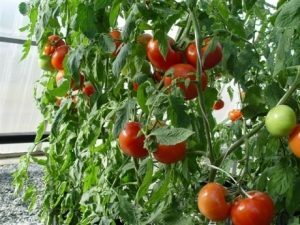 It has early blight and Verticillium wilt resistance (Ve gene) and resistance to races 1 and 2 of Fusarium wilt (I and I-2 genes). In repeated field observations, NC 25P has shown moderate resistance to defoliation by bacterial spot. Determinate with heavy foliage cover. Fruit are intermediate in length with 2-3 (mostly 3) locules and jointless pedicels. Immature fruit are uniform, light green. Fruit are highly resistant to gray wall and fruit cracking. Male parent in ‘Plum Regal’ F1 hybrid. 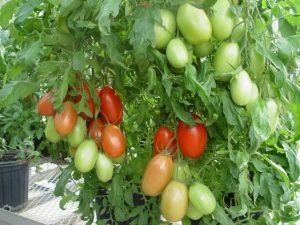 NC 30P incorporates the Sw-5 gene for resistance to tomato spotted wilt virus (TSWV) into a superior fresh market plum tomato background. 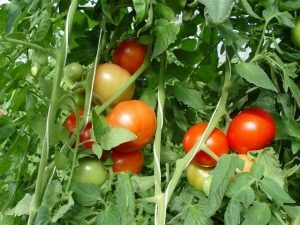 Also has resistance to Verticillium wilt (Ve gene) and races 1 and 2 of Fusarium wilt (I and I-2 genes); has moderate resistance to early blight. Plant growth habit is determinate. 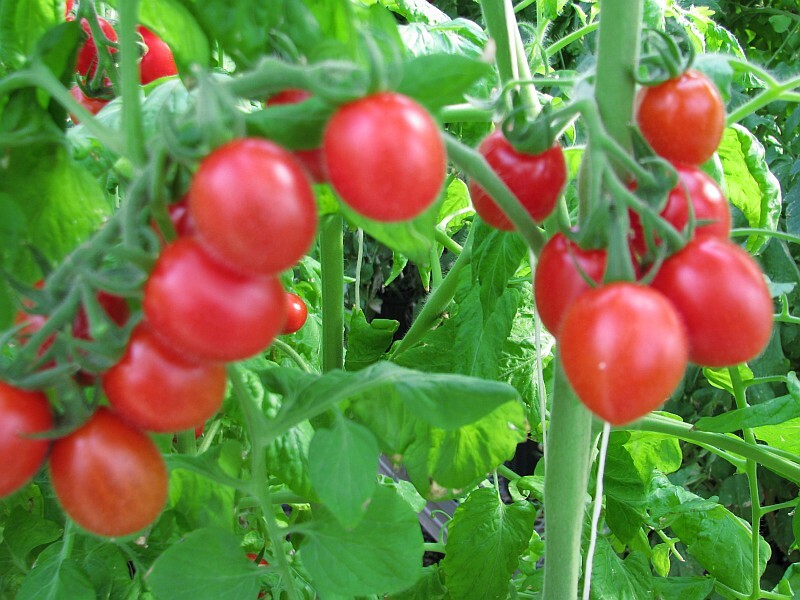 Fruit are highly elongate with 2-3 (mostly 3) locules; has the crimson gene for increased lycopene and has jointless pedicels; highly resistant to gray wall and fruit cracking. NC 30P is segregating for the ms-10 gene for male sterility linked to the green stem seedling marker gene aa. Female parent in ‘Plum Regal’ F1 hybrid. 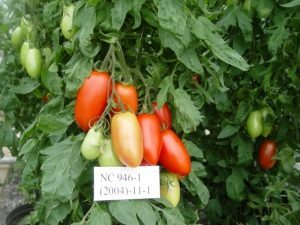 NC 946 is a determinate fresh-market plum tomato line with the Sw-5 gene for resistance to TSWV and the I-3 gene for fusarium wilt race 3 resistance. Highly elongate in shape with crimson fruit color and jointless pedicels. Resistant to gray wall and fruit cracking. Useful as a parent in combining with short to intermediate length plum tomato lines for developing F1 hybrids. NC 1 Grape has a compact indeterminate growth habit as a result of the brachytic gene for short internodes. 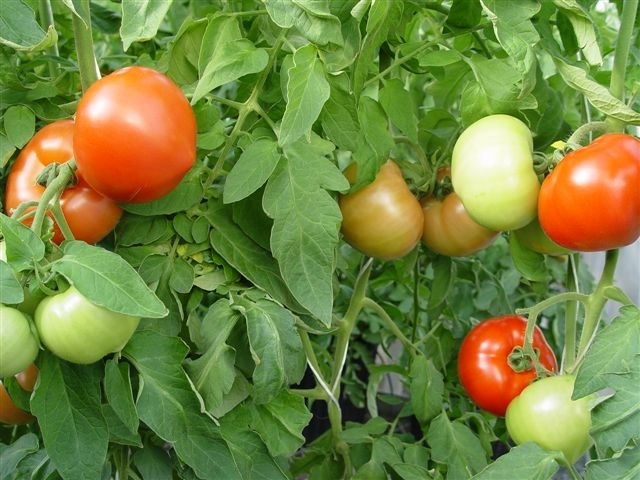 It is early in maturity and high in sugar with good flavor and good fruit characteristics. NC 2 Grape has a compact indeterminate growth habit as a result of the brachytic gene for short internodes. 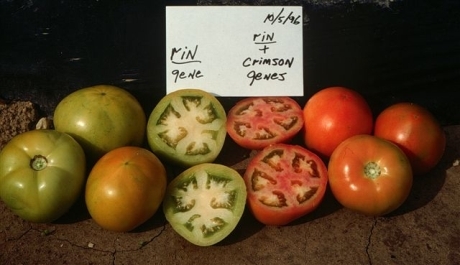 It is homozygous for the rin gene combined with another genetic factor which improves fruit color. When fully mature, it develops a deep orange exterior color. Fruit have a high sugar content. This line is useful as a parent in developing extended shelf life in F1 hybrids of grape tomato. 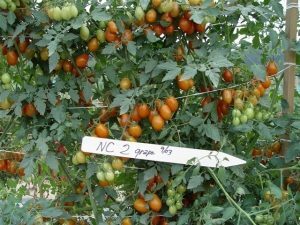 NC 3 Grape is a high sugar grape tomato line with compact determinate growth habit resulting from the brachytic (br) gene. It is segregating for the ms-10,aa male sterile, green stem seedling marker combination. Has fruit size (~10 gm/fruit) similar to that of ‘Santa’; resistant to bursting and rotting. Has jointless pedicels; uniform light green immature fruit. 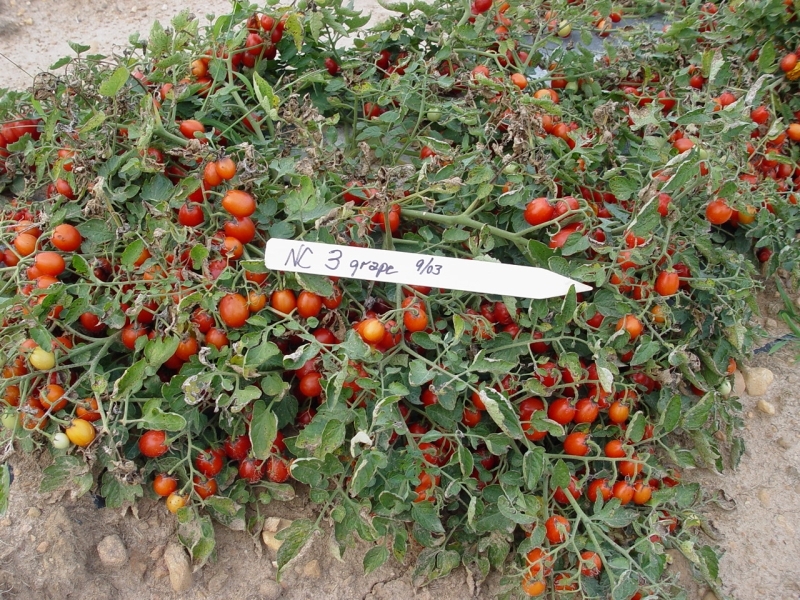 Moderate early blight resistance (NC EBR-6 source). 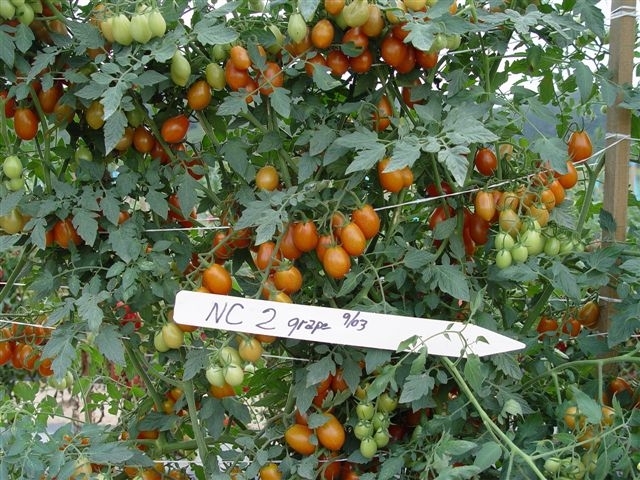 NC 4 Grape combines the resistance to fusarium wilt race 3 and tomato spotted wilt virus resulting from incorporation of the (I-3) and (Sw-5) genes. It has compact, indeterminate growth habit resulting from incorporation of the recessive (br) gene. 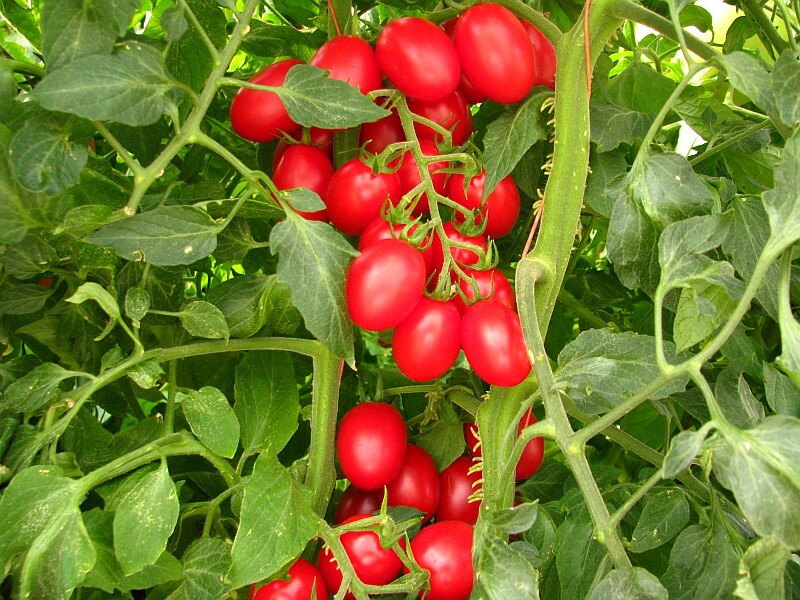 It has the crimson (ogc gene) fruit trait giving improved red color and increased lycopene content. 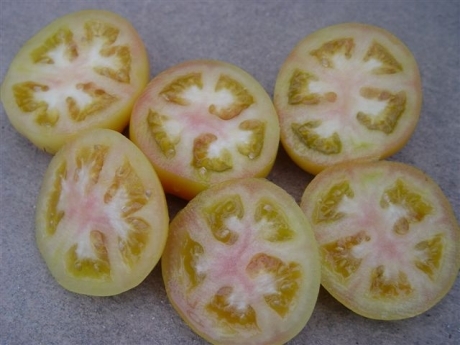 NC 4 Grape is heterozygous for the ms-10, aa gene combination, which provides male sterility that can be easily identified in the seedling stage to facilitate use of the line as a female parent without the need for emasculation of flowers to cross F1 hybrid seed. 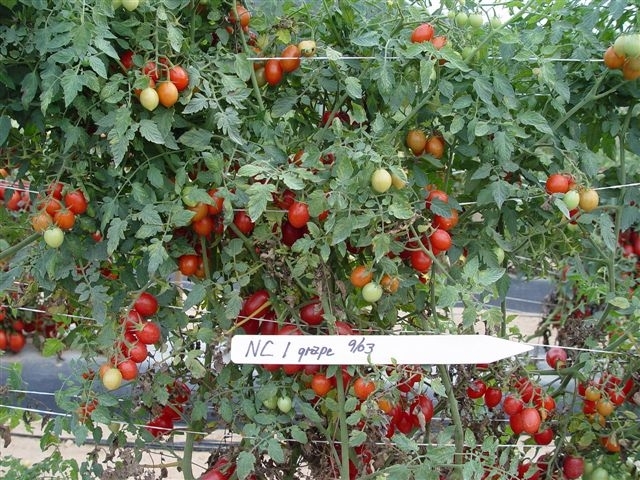 NC 5 Grape is useful as a parent in developing superior F1 hybrid grape tomato cultivars. It has a desirable compact, indeterminate growth habit as a result of the brachytic (br) gene for short internodes. Plant foliage is an attractive dark green, and the plant holds up well into late season. 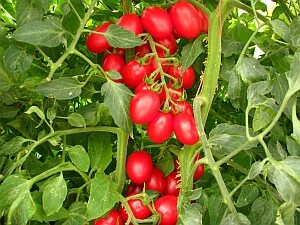 Fruit are deep red in color and have the crimson (ogc) gene for improved internal red color and increased lycopene content. It is highly resistant to fruit cracking and bursting. 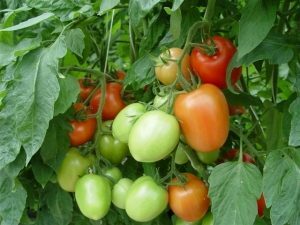 Fruit are desirable size and shape for grape type tomatoes and are high in sugar level with a crisp texture and sweet flavor. 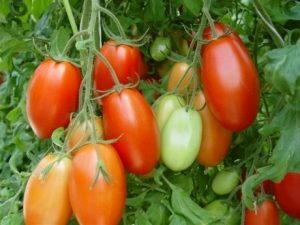 NC 6 grape is the first known breeding line of grape tomato to combine the Ph-2 gene conferring resistance to late blight. It has a compact, indeterminate growth habit which results from expression of the brachytic (br) gene for short internodes. It has ovate shaped, dark red fruits of approximately 16 grams per fruit that are highly resistant to fruit cracking and bursting and have a crisp texture with high sugar level, giving a very sweet taste. 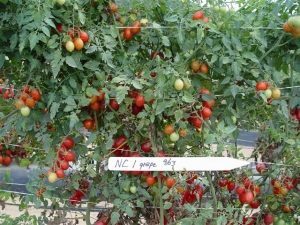 NC 6 Grape is useful as a parent for incorporating late blight resistance and desirable plant and fruit traits into grape tomato F1 hybrids. 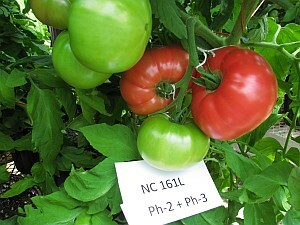 NC 161L is a determinate inbred tomato line with pink external color (red flesh in combination with clear skin (y gene). It is large in size with smooth, deep oblate fruit shape. Immature fruit have dark green shoulders and jointed pedicels. Disease resistances include late blight (Ph-2 + Ph-3 genes combined), verticillium wilt (Ve gene), fusarium wilt race 1 (I gene), and root knot nematodes (Mi gene). 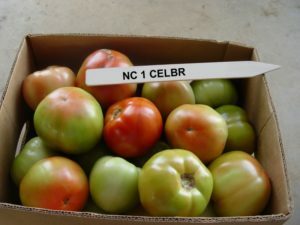 NC 161L has good fruit texture and flavor and is moderately resistant to fruit cracking. It combines well in F1 hybrids and is a parent in ‘Mountain Rouge’ ( NC 161L x ‘Pink Brandywine’).